Staging of ejectors becomes necessary for economical operation as the absolute suction pressure decreases. Based upon the use of auxiliary equipment, two and three-stage ejectors can either be condensing or non-condensing types. Four, five, and six-stage units can also be non-condensing, but are usually condensing types. Two-Stage Steam Jet Ejectors have the same general field of application as the single stage units. They handle both condensable and non-condensable gases or vapors, as well as mixtures of the two. The general operating range is between 5" Hg. abs. and 3 mm Hg. abs. Depending on conditions, however, a single-stage unit may be more economical at the top of the range and a three-stage unit near the bottom. Three-Stage Ejectors are recommended for applications where a two-stage unit will not provide low enough suction pressure economically. Applicable range is from 26 mm Hg. abs. to 0.8 mm Hg. abs. but economics might dictate use of a Two-Stage Ejector at the upper part of the range and a Four-Stage Ejector at the lower end. Three-Stage Condensing Steam Jet Ejectors consist of a booster ejector, a booster condenser, and a Two-Stage Ejector consisting of a high-vacuum ejector, intercondenser, and low vacuum ejector. In some applications another condenser (after-condenser) can be used at the low vacuum ejector discharge. 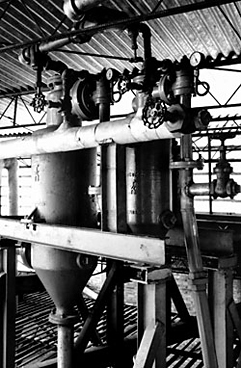 Typical Three-Stage Steam Jet Ejector used in processing vegetable oils. 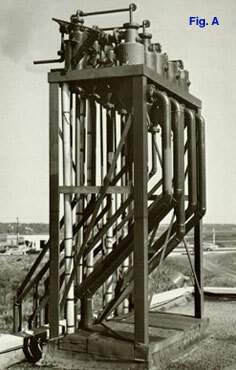 Three-Stage Steam Jet Ejector with Booster. Four-Stage Ejectors – 4 mm Hg. abs. to 75 microns Hg. abs. Five-Stage Ejectors – 0.4 mm Hg. abs. to 10 microns Hg. abs. Six-Stage Ejectors – 100 microns Hg. abs. to 3 microns Hg. abs. Four-stage units consists of (1) a primary booster ejector; (2) a secondary booster ejector; (3) a high vacuum ejector; (4) a low vacuum ejector; and (5) usually two condensers—one after the secondary booster ejector and the other between the high vacuum and low vacuum ejectors. The condenser between the high and low vacuum ejectors is sometimes omitted, depending upon application requirements. Direct contact or surface condensers, arranged barometrically or at ground level, can be used. The four-stage is similar to the three-stage unit except that another booster ejector is added. In the four-stage, the primary booster is steam-jacketed to prevent build-up of ice on the diffuser internal bore. The five and six-stage units are similar in appearance to the four-stage ejector except that additional booster ejectors are added. 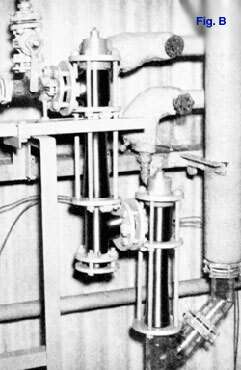 While four, five, and six-stage ejectors are usually condensing types for reasons of efficiency and operating economy, it is possible to employ non-condensing types. For more detailed information about Multi-Stage Steam Jet Ejectors, Bulletin 5-EH Literature. To submit a Request for Quote (RFQ) for Multi-Stage Steam Jet Ejectors, Adobe PDF or submit an online interactive RFQ Form for Steam Jet Vacuum Systems. The booster ejector diffuser should normally be steam jacketed when design suction pressure is less than 4.6 mm Hg. abs. Typical arrangement of a Three-Stage Steam Jet Ejector with a Steam Jet Booster. Five-Stage Steam Jet Ejector used in steel degassing application.